Phylogenetic analyses have demonstrated that nonfeeding larvae have evolved from feeding larvae many times among marine invertebrates. In light of this observation, it is surprising that an intermediate strategy, a larva that can feed but is provisioned with enough energy to metamorphose without acquiring exogenous food (i.e., facultative planktotrophy), is rare. 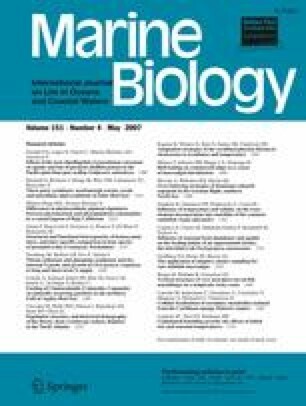 A hypothesis for the lack of facultative planktotrophic species among marine invertebrates is that the transition from feeding to nonfeeding is rapid due to this intermediate stage being evolutionarily unstable. Evidence that would support this hypothesis is if species with facultative planktotrophy have reduced food assimilation when compared with obligate planktotrophs. We studied a species with facultative planktotrophic larvae, Clypeaster rosaceus, that is very near the boundary between facultative and obligatory planktotrophy, to answer two questions: (1) does feeding during the larval stage result in energy gains in larval or juvenile stages and (2) if not, are larvae capable of assimilating exogenous food at all. Our measurements of energetics in larval and juvenile stages show that C. rosaceus larvae accumulate very little if any energy when fed, but stable isotope data indicate that larvae are able to assimilate some food. Our results are consistent with similar studies on facultative planktotrophic larvae suggesting poor food assimilation and rapid loss of larval feeding after a population evolves the ability to reach metamorphosis without feeding (lecithotrophy). Communicated by P.W. Sammarco, Chauvin. We would like to thank D. Julian, G. Paulay, and B. Pernet for many constructive comments. We would also like to thank three anonymous reviewers for insightful comments and suggestions that substantially improved our original manuscript. This work was supported by a grant from Sigma Xi to A. Reitzel, a NSF grant to L. McEdward (OCE 9819593), and a NSF grant to S. Morgan and B. Miner (OCE 0325028). Contribution number is 2366, Bodega Marine Laboratory, University of California, Davis. We dedicate this work to the late L. McEdward for inspiring us to study life-history evolution in marine invertebrates. The performed experiments comply with the current laws of the United States of America.